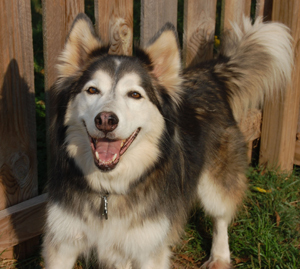 Roland is a handsome 8 year old Siberian Husky whose brown eyes are certain to melt your heart. He is a “whooly” or long-hair husky who always has that Siberian smile and is ready to be with you in whatever you are doing. Roland is a victim of the economy and came into rescue with his companion, Alli. While not a bonded pair, they do enjoy each other and would love to go to their new home together. They will be fine separated, but it is best that they live with another Siberian. Roland is trustworthy in the house and loves his crate. He can be the typical husky escape artist and will need a sturdy 6-foot fence to keep him safe and sound. If you have room in your home and heart for this great guy, please let us know!